In my quest to clean up my diet, I’ve been contemplating foods I can eat to satisfy my sweet tooth without turning to refined sugars. As someone who has a growing list of healthy dessert recipes, I came across a recipe for a wonderful chocolate truffle from one of my favorite vegan food blogs, The Minimalist Baker. These truffles are so freakin’ delicious and super easy to make. But I would caution that when melting the chocolate, to use a double boiler and melt over low heat. The longer you let the chocolate set in the boiler, it can thicken and clump and that’s what you don’t want. Remove as soon as the chocolate is as smooth as liquid and then proceed with dipping the truffles. 1. Place pecans and walnuts in a food processor or high speed blender and process until it reaches the consistency of a meal. Set aside for now. 4. Once you have a dough that’s easy to form into balls, scoop out 1 Tablespoon amounts and roll/carefully form into balls. 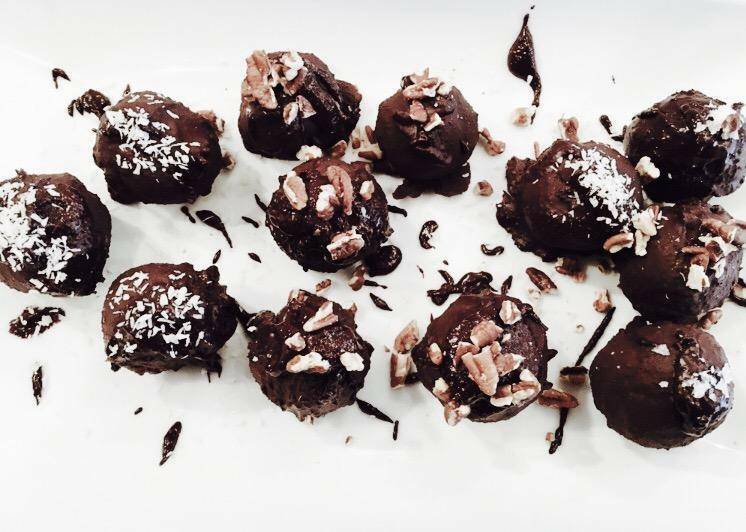 Set on parchment paper and place in freezer to chill – you should have about 14 truffles. 5. In the meantime melt chocolate in a double boiler or in the microwave in 30 second increments. Be careful not to overheat. Once melted, stir in coconut oil to help the chocolate thin and ease the dipping process. 7. Repeat until all truffles are dipped. Let set at room temperature.